In the last week - especially concentrated into the last 48 hours - I've put together four pieces of IKEA furniture, hung a wall cabinet and two mirrors, and painted my bathroom and a third of my bedroom. Lord knows I love the Swedes. They are my countrywomen after all. But, I can't tell you how happy I'm going to be once I never have to look at another one of their funny shaped "special IKEA" screws again (which, by the way, get stripped if you try to screw them in with a drill, get stuck and cause you to lose about a half hour trying to coax them out). Although a productive Easter, I would not voluntarily repeat the experience next year. I much prefer the soothing ritual of egg-dying and snacking on mini eggos over forcing 9 feet long pieces of stubborn wood to form themselves into reluctant rectangles. But that was the crux of it: with all those boxes of pieces waiting to be assembled and walls waiting to be painted, there was no time for egg-dying. I'm so tired! And sore. Really, really sore. Something positive, however, in addition to my new furniture, came out of the experience: Before & After pics! Who doesn't love a good make-over? Unfortunately, I still have 3/4 of my room to paint and half a wardrobe to put together because IKEA forgot to ship me all of the necessary hardware, so things are not quite perfect enough to give you the full "after" effect in both the bedroom and bathroom, but I can show you some tidbits. 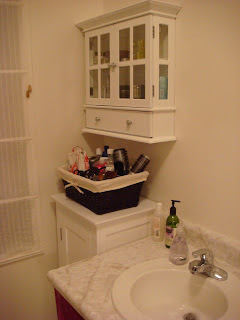 Behold, one corner of the bathroom, before & after: Note the vast improvement a paint job, cabinets from Bed Bath & Beyond, and a black wicker basket can make on a girl's space for products. Because the closet/wardrobe is still in progress (code for: lying in inconvenient pieces all over my bedroom), I can't show you that just yet. 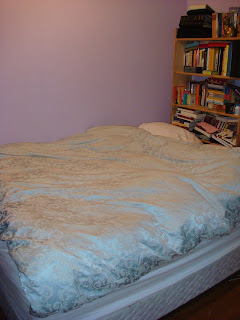 I can, however, show you my bed. I don't think the pictures do it justice, but the difference - to me - is remarkable. The transformative effects of a bed frame, as opposed to the hideous metal box spring support I've been laying on top of for the last 12 years can not be over emphasized. Three times today, in between battling the wardrobe, I found myself drawn to my bed, fluffing up the pillows, and just laying back against my headboard, taking a load off. I never used to do that when all I had behind my head was a book shelf. I've decided I love headboards. 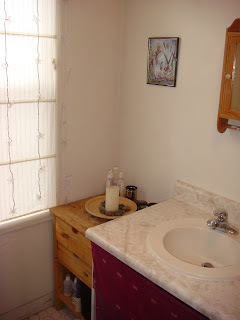 They're my new favorite things, along with swiss coffee colored walls (I was so unbelievably sick of that lilac color). By the way, the inexplicable something, which is considerably improved on Day-4 of what will be a 10-day course of super antibiotics, has a name. It's called CA MRSA, and it's probably in a gym or on public transportation near you, so look out! First of all, I'm so glad a doctor could identify the inexplicable something and that you are now on your way to feeling much better!!! Third, I love your room improvements. Question: Have you moved to a new place, or are these upgrades to your same place? You wrote about your unhappiness with your apartment situation, but I wasn't sure if this is a new place or not. I'm hoping so!!! these are great after pictures!